Many countries have committed themselves to reduce ammonia emissions. These are mainly caused by agriculture. Cattle husbandry accounts for the largest share of this. Apart from slurry storage and application, housing construction measures are coming into focus more and more. However, there are currently no concrete guidelines for implementation. Moreover, animal welfare should not be ignored. Possible solutions often contain several components. The success of a system also depends heavily on housing management. Measures combining both environmental protection and animal welfare will become interesting in the near future. 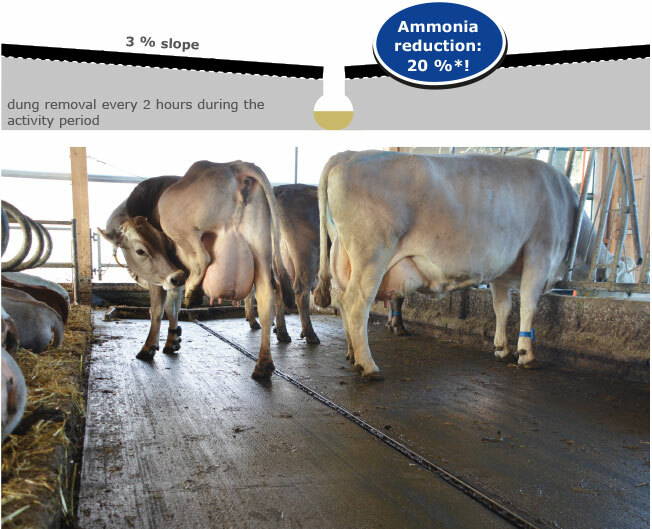 How does ammonia develop in the cow house? The urea in the urine is split into ammonia and carbon dioxide by the enzyme urease within a short time. Important factors besides the house climate are the floor condition and its cleanliness. How can ammonia emissions be reduced? We will be pleased to advice you! Animal and environmental protection hand in hand!